File Zane Grothe, seen after his July 29 win in the men's 800-meter freestyle final at the U.S. national championships swimming meet in Irvine, California, won a gold medal in the same event at the Pan Pacific Swimming Championships on Aug. 12 in Tokyo. 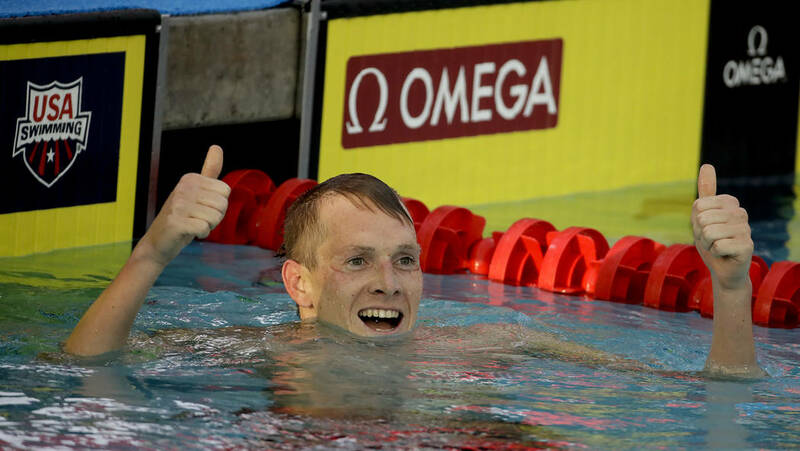 Zane Grothe, a 2010 graduate of Boulder City High School, earned another gold medal this summer, winning the 800-meter freestyle Aug. 12 with a final time of 7 minutes, 43.74 seconds to set a new Pan Pacific Swimming Championships meet record. Swimming at the Tokyo Tatsumi International Swimming Center in Tokyo on Aug. 9-14, Grothe broke Australian Grant Hackett’s 2002 meet record of 7:44.78. Improving on his 7:44.57 finish from the Phillips 66 in July, Grothe is now the second-fastest American swimmer of all time in the event, falling just short of Michael McBroom’s record time of 7:43.60 set in 2013. Grothe also took silver in the 1,500 freestyle with a time of 14:48.40 and bronze in the 400 freestyle with a time 3:45.47. His win in the 800 freestyle qualified him for the 2019 FINA World Championships to be held in Gwangju, South Korea, in July.